One Punch Man, possibly one of the best anime’s this season. Saitama, any enemy he hits just once turns into nothing but mush. Possibly one of the strongest members of the Hero Association, he can punch any enemy once and instantly kill them, with his strength and speed, he’s taken Genos as his apprentice to teach him a few things. As this fantastic artwork shows, he’s power deserves more recognition. 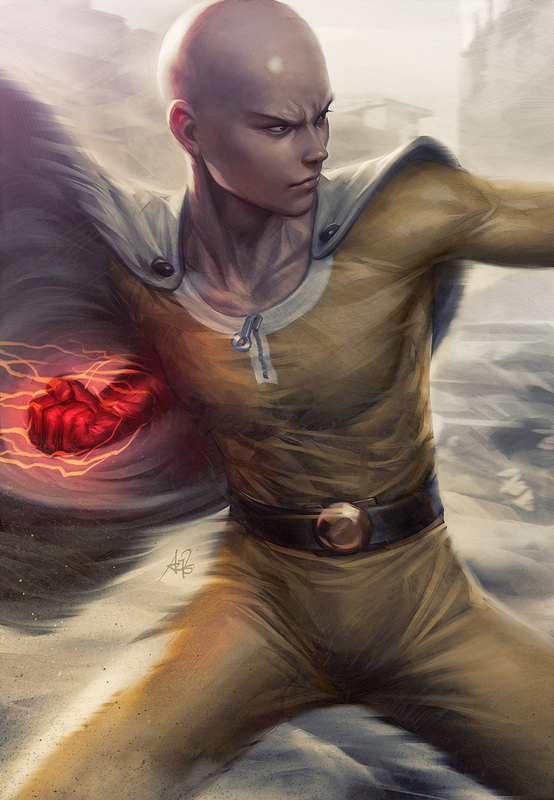 As smooth as Saitama’s head is, his power has no limit, he’s capable of battling so many enemies that it’s frightening. This amazing artwork was done by Artgerm, who is very popular, he has some really amazing artwork based on many different anime, games and other media. Check them out, otherwise be sure to go on ahead and share this fantastic artwork with other fans of the show. One Punch Man is an amazing anime! The animation, the plot, the characters are absolutely awesome! Totally agree with you, a few weeks ago I spoilt it for myself and read up on the manga, what happens next is amazing, especially in the next few episodes! He’s so amazing! I still haven’t finished watching it but I will surely start again. Yeah, Saitama is a boss! But Goku is still the boss . one puch man is the best Animation ever i love the show i think its better then any other ANIMATION ….